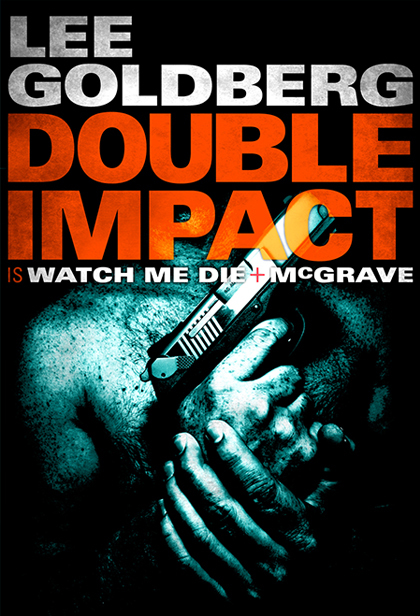 Double Impact brings together two of Lee Goldberg’s most exciting, funny, and acclaimed adventures — Watch Me Die and McGrave — for the first time in one bargain-priced volume. Harvey Mapes is a 26-year-old security guard who spends his nights in a guard shack outside a gated community in Southern California, reading detective novels, watching reruns, and waiting for his life to finally start… which happens when Cyril Parkus, one of the wealthy residents, asks Harvey to follow his beautiful wife Lauren. The lowly security guard jumps at the opportunity to fulfill his private eye fantasies and use everything he’s learned from Spenser, Magnum, and Mannix. But things don’t exactly go according to the books…or the reruns. As Harvey fumbles and stumbles through his first investigation, he discovers that the differences between fiction and reality can be deadly. Los Angeles cop John “Tidal Wave” McGrave is an unstoppable force of nature who always gets his man…even if it means laying waste to everything around him, including his own career…which is exactly what happens in his pursuit of Sebastian Richter, the ruthless leader of an international gang of violent thieves. When Richter flees to Berlin, McGrave chases after him…even though the cop doesn’t know the language, the laws, or the culture. But McGrave doesn’t care…he speaks the universal language of knee in the groin and fist in the face…and he won’t let anything get in his way. Hold on tight for a wild, rollicking, action-adventure novella that captures all of the fun, excitement and pure escapist pleasure of the Dirty Harry, Lethal Weapon and Die Hard movies…with the humor, sharp dialogue and inventiveness that you’ve come to expect from Lee Goldberg, bestselling author of The Walk and fifteen hilarious Adrian Monk mysteries.